Hickory Bay West Condos: ***Huge Price Reduction***Motivated Seller***PANORAMIC GULF AND BAY VIEWS FROM PENTHOUSE 603...HICKORY BAY WEST. Hickory Bay West is situated right on Hickory Bay with endless southern bay views from every room in the condo and views of the Gulf also! This renovated condo boasts diagonal tile, white panel cabinetry, granite counters, and 2016 Trane A/C. Also newer refrigerator and sold furnished as seen/turn-key. Extra space in the guest bedroom for a small office! Enjoy watching the boats go by, the dolphins playing, and the beautiful Florida sunsets from your oversized lanai-(the complete width of the condo and wide enough for a 4+ seat table). Only a short walk to the beach and the local restaurants, boat out to the warm Gulf waters (no bridges), and a short drive to the fine dining/shopping at the Promanade, Coconut Point, Mercato, Olde Naples and the airport! A bay front sparkling pool/spa, extra storage, bike storage, kayak/canoe/paddle board storage & launch area AND BOAT DOCKS always available for use, complete this piece of paradise. THIS PARTICULAR CONDO COMES WITH A COVETED UNDER BUILDING COVERED PARKING SPOT! Located in Collier County=lower taxes. Hickory Bay West Condos: Wide open Bay views from every living area in this open-concept sundrenched condo with fully renovated kitchen. Located in North Naples/Collier County, it’s only a short walk to Barefoot Beach. Community boat docks available in your own backyard, allowing you a scenic 5-minute boat ride to the Gulf through Little Hickory Bay & Wiggins Pass. Highly coveted Southern Exposure for picture perfect sunsets over the sparkling bay year-round, best enjoyed from the wraparound screened lanai, accessed from the master, guest bedroom & spacious living room alike. Kitchen boasts a modern décor with granite counters, crisp white cabinets & sleek handles, stainless steel appliances & stylish tiled backsplash. Master bedroom with ensuite, walk-in closet, dual sinks & soaking tub. Sizable guest bedroom with a bonus area large enough for an office or reading nook. Stackable washer/dryer in unit. Perfect vacation retreat, rental investment or forever home. Amenities: Heated pool & spa, clubhouse, bike rack, kayak storage/launch, BBQ grill & storage space. 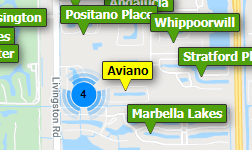 Close to Coconut Point, Mercato & restaurants galore. Need professional assistance selling your property at Hickory Bay West Bonita Springs? Find out how an Area Specialist can help to generate more property exposure in order to get the most money for your investment in the least amount of time.